Gavin Turk has a well developed sense of less is more. A cardboard box, a scrunched-up plastic bottle, a selection of throwaways that could easily have you looking twice at objects you put in the bin. All offer themselves unadorned to the visitor's interpretation, in Turk's hands, elevated to art. I rather admire it. Not that the artist doesn't offer clues - for example, in his titling, part after all, of the work. Thus we have some almost squeezed out paint tubes, curved like ancient toothpaste tubes, and minus their labels. Their titles are, variously, 'Payne's Grey, 'Raw (and 'Burnt) Sienna' and, wittily accessible even to non-artists, 'Reclining Paint Tube'. 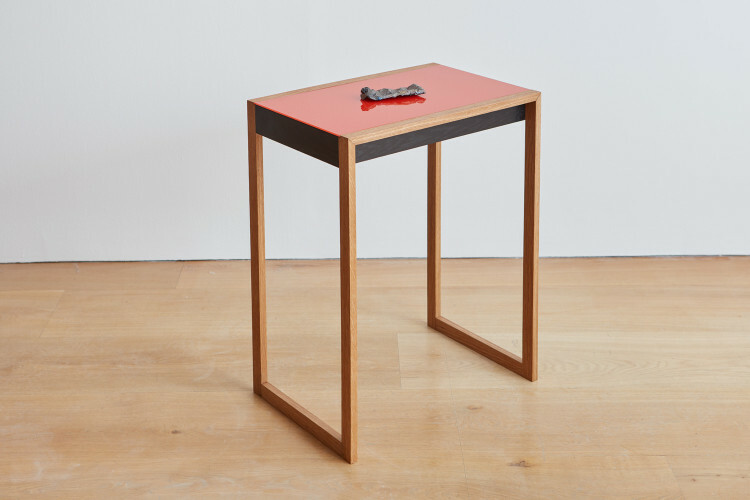 Each of the paint tube works is subtitled '(Albers Table)', a reference to the fact that their 'plinths' are three of the nesting tables Josef Albers designed in the 1920s (see above). I'm going to leave it there. The smaller of Turk's two shows is at Ben Brown Fine Arts (until Wednesday 12 April), the bigger solo show is at Damien Hirst's Newport Street Gallery (until Sunday 19 March).